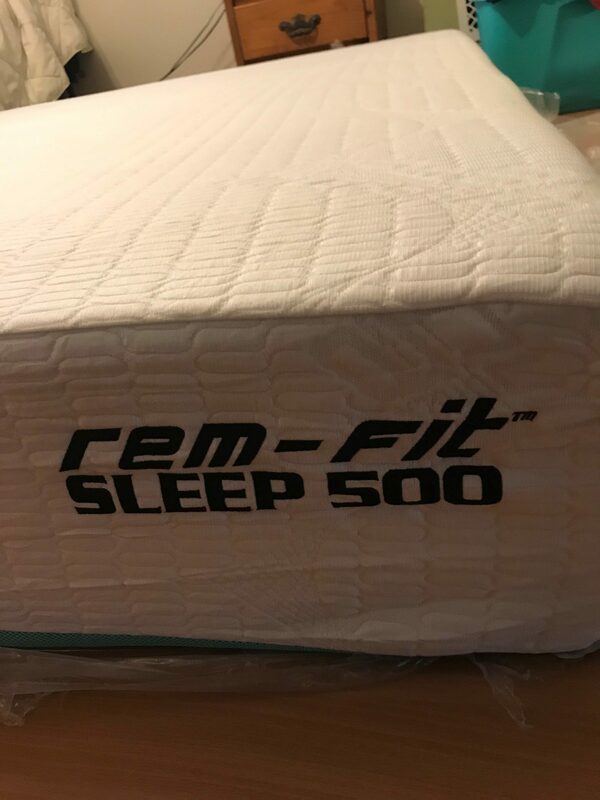 REM-Fit Sleep 500 Mattress Review was recently completed by the MattressJunkie.com team. REM-Fit Sleep 500 Mattress is a 12 inch hybrid memory foam and pocket coil cooling mattress. REM-Fit sent us over a queen sized mattress that retails for $1099.99. We recently reviewed the REM-Fit Sleep 300 Mattress and REM-Fit Sleep 400 Mattress. The REM-Fit Sleep 500 Mattress is the hybrid option while the 300 and 400 are all memory foam. REM-Fit is a division of Protect A Bed and has 35 years of sleep industry experience. The REM-Fit team believes in a restful sleep experience and has an array of sleep related products. REM-Fit was launched in 2014 as an active bedding brand that helps sleepers achieve a healthy and active lifestyle by getting the best sleep possible for maximum recovery and comfort. Check out how REM-Fit Sleep 500 Mattress stacked up in our review process. What’s the REM-Fit Sleep 500 Mattress cover made of? REM-Fit Sleep 500 Mattress has Nordic chill fiber in their Hi Flow knit top. REM-Fit Sleep 500 Mattress also features the Re-Ax Unleashed temperature regulating, moisture wicking cover. 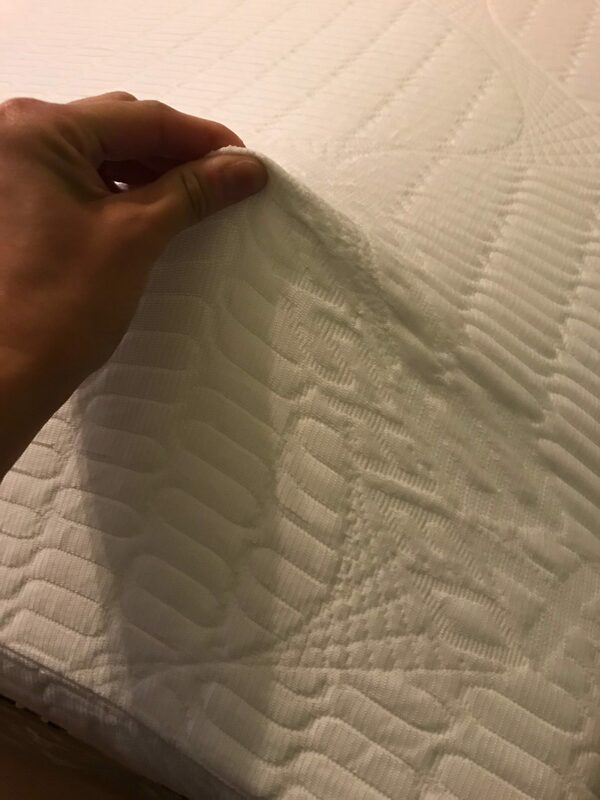 The cover has a nice stretch around the mattress and has a ventilated mesh side to add more cooling to the overall mattress. 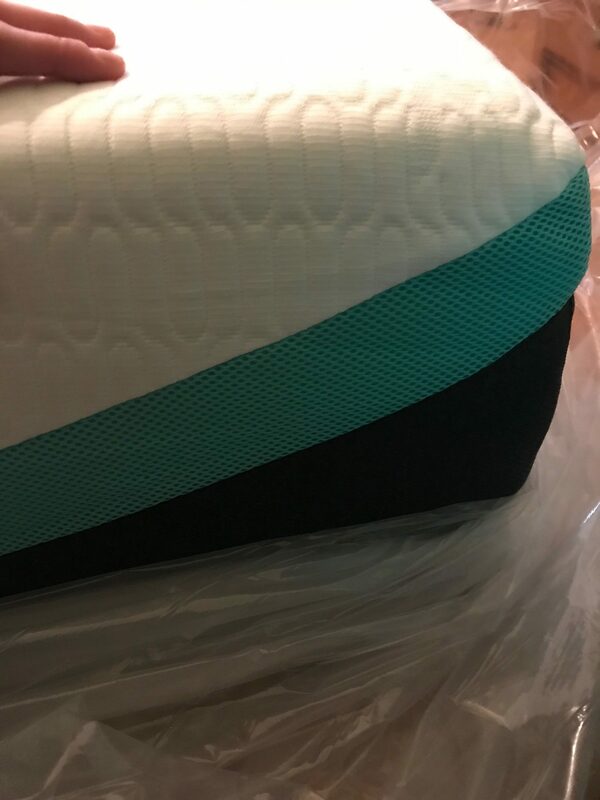 The REM-Fit Sleep 500 Mattress has a teal and gray color scheme. All of the REM-Fit mattresses have trendy color schemes. What’s under REM-Fit Sleep 500 Mattress cover? The REM-Fit Sleep 500 Mattress has 5 layers below the cover and is 12 inches in height. The first layer is .7 inches of adaptive foam. This cool and comfortable foam is infused with gel to disperse heat and regulate sleep temperature. The second layer is 2 inches of cradle foam. Cradle foam contours with the sleeper’s body and on the REM-Fit Sleep 500 Mattress, you sleep cool while you are cradled. The third layer is 1 inch of transition foam. This layer is created to amplify the comfort of the pocketed coils underneath and also provides individualized support and motion isolation. The fourth layer is a 6.3 inch layer of pocketed coils. Pocketed coils sleep quiet and are supportive and durable. Pocketed coils provide customized support while being responsive to movement as well as the sleeper’s body. The fifth and final layer is 2 inches of support foam. Support foam serves as the base of the mattress. High quality support foam is key to mattress longevity and support for years to come. What type of sleep style works best for the REM-Fit Sleep 500 Mattress? The REM-Fit Sleep 500 Mattress would be great for all sleep styles. Hybrid mattresses don’t have the “sinkage” of memory foam so sleeping on your side, back, or stomach would all be very comfortable on the REM-Fit Sleep 500 Mattress. 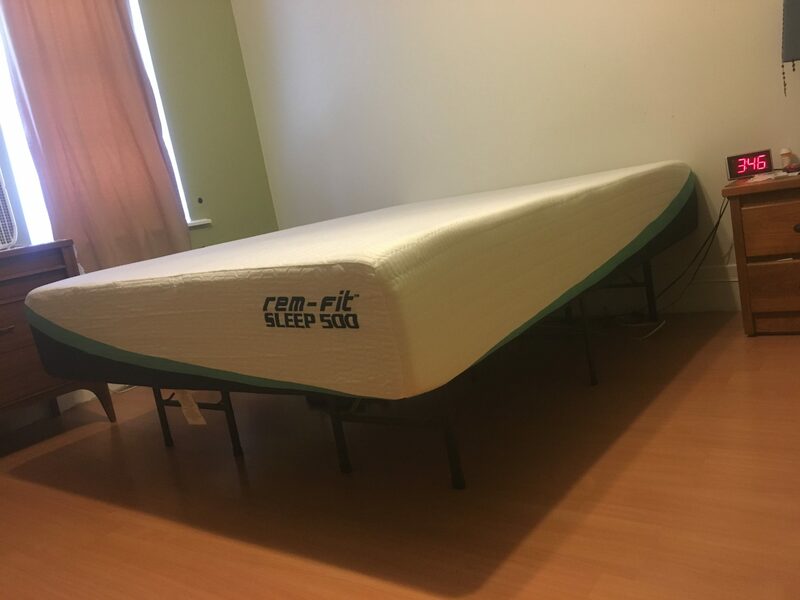 How much does the REM-Fit Sleep 500 Mattress cost? What type of warranty does the REM-Fit Sleep 500 Mattress have? The REM-Fit Sleep 500 Mattress has a 10 year warranty. What surface is best for the REM-Fit Sleep 500 Mattress? We reviewed our mattress on a slatted bed frame. Any hard surface like a platform base, box spring, adjustable bed, or the floor would work great with the REM-Fit Sleep 500 Mattress. Do we recommend the REM-Fit Sleep 500 Mattress? We loved the REM-Fit Sleep 500 Mattress. REM-Fit did a great job building this hybrid version of the mattress line. All sleepers can sleep cool and comfortable on this sleep surface. We also love REM-Fit’s dedication to fitness and sleep data. REM-Fit gives all purchasers of their mattresses the opportunity to see their sleep data through the REM-Fit Active 100 Sleep and Activity Tracker. Once your band is sync’d to the REM-Fit app, you can start seeing your data and make changes to help live a healthier and happier lifestyle. The REM-Fit Sleep 500 Mattress would be a great choice for all sleep styles not wanting an all memory foam mattress. 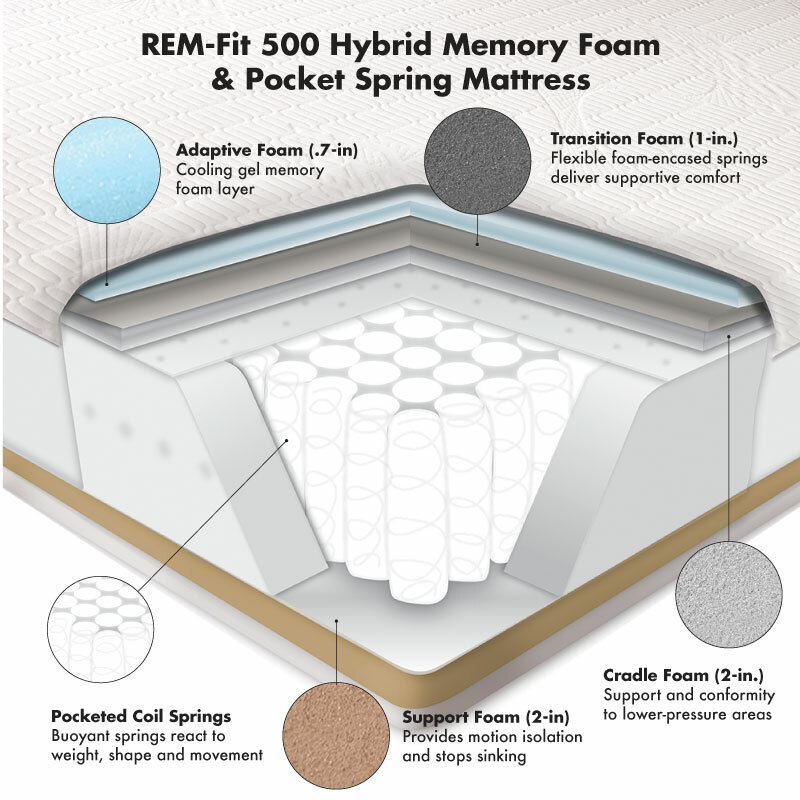 Learn more about the REM-Fit Sleep 500 Mattress here….